Here’s a snippet from the Institute of Physics website at physicsworld.com. This is of interest in relation to Dayton Miller’s interferometry results from the 1930’s, which measured anisotropy in the speed of light. New analysis of IBEX data – which has been carried out by David McComas of the Southwest Research Institute in Austin, Texas, and an international team – suggests that the bow shock does not exist after all. In other words, the solar system is not moving as fast as we though relative to the interstellar medium. Launched in 2008, IBEX orbits the Earth and is designed to study fast-moving neutral atoms. What McComas and colleagues did was to use IBEX to characterize neutral atoms from the interstellar medium that cross into the heliosphere. Because these atoms are not electrically charged, they are not affected by magnetic fields – and so their speed should correspond to the relative velocity of the interstellar medium. The study suggests that the relative speed is about 84,000 km/h, which is about 11,000 km/h less than previously thought. In addition, data from IBEX and earlier Voyager missions suggest that the magnetic pressure found in the interstellar medium is higher than expected. When these parameters were fed into two independent computer models of the heliosphere, both suggested that a bow shock does not exist, but rather a gentler “bow wave” occurs at the interface. 208km/sec is 748800km/h, close to an order of magnitude faster than the 73000km/h inferred from the IBEX data. This would imply that the local interstellar medium is also entrained, to a slightly lesser extent, by the heliosphere. Perhaps we’ll get a better idea of the gradient as Voyager moves further beyond the heliopause in years to come. 1) Dayton Miller, “The Ether-Drift Experiment and the Determination of the Absolute Motion of the Earth”, Reviews of Modern Physics, Vol.5(2), p.203-242, July 1933. Has anyone come across an explanation? 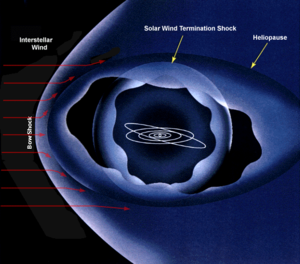 I am always curious when a heliosphere illustration excludes ….. The existence of the radial component of the electric current flowing toward the Sun is revealed in numerical simulation. The total strength of the radial current is ~ A. 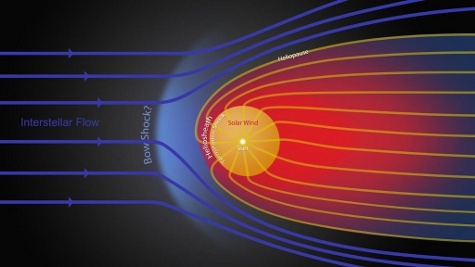 The only way to fulfil the electric current continuity is to close the radial electric current by means of field- aligned currents at the polar region of the Sun. 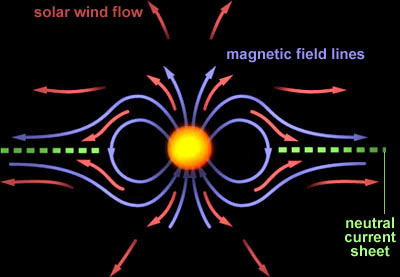 Thus, the surface density of the closure current flowing along the solar surface can be estimated as ~4 A/m, and the magnetic field produced by this current is T, i.e. several percent of the intrinsic magnetic field of the Sun. This seems to mean that any treatment of the solar magnetic field generation should take into account the heliospheric current circuit as well as the currents flowing inside the Sun. gravity is only holding things together, it is its electric and magnetic forces that make our planet what it is. Nicola Scafetta: Does the Sun work as a nuclear fusion amplifier of planetary tidal forcing?